Maybe becuase it was a longer race but not many made an appearance for either of these. Conditions were a litle blustery I seem to remember. None of our First claim runners took part in this race but it was the weekend after the Grizzly so maybe they had an excuse. Still, a reasonbale turn out of our contemporaries for the slog out to Mawnan Smith and back. 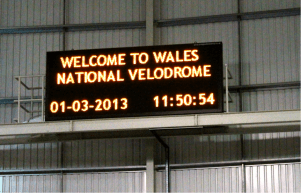 The inaugural Tri Logic trip to the Velodrome on the 1st March saw 16 eager (?) riders take to the boards. A few nervous faces peering over the banking from the seated area greeted us when we arrived! We arrived early only to find everyone else was super enthusiastic and had been waiting a while, having set off at some unearthly hour. After a quick introduction to the fixed wheel bikes the group, consisting of familiar faces and guests, were given an induction to the track terminology and after a short practice soon found themselves riding on the steeply banked track (42 degrees) with smiles, concentration and focus – not necessarily in that order. As skill levels increased the drills and mock races teased out the competitive spirit simmering in the seasoned athletes. 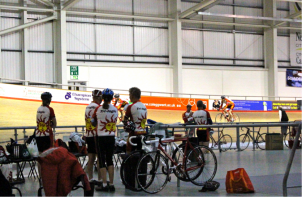 Pursuit groups set by the coach ‘Brian’ saw 5 rider teams chasing down the opposition with skillful changes and precision riding (well sometimes!). A 500m flying time trial saw riders line up ‘on the fence’ ready for their effort! Which is a painful experience of burning quads and oxygen debt-not to be missed. Not to mention the burning from the friction of skin versus wooden track in some cases! Efforts done, a more mellow warm down saw group riding that could grace a training session with a neat string of riders riding with the skill and composure that could be a match for Jason Kenny yet! This year saw a good turn out of TLC members for the first run of the revised An Res Hellys route. 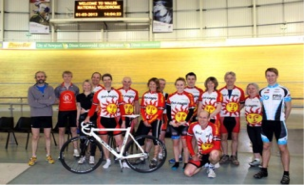 It was great to see some of our new members out in club kit. We had a fair spread of first and second claim runners all lining up on what was a rather cold morning. Most of the route was unchanged and a densely packed mass of bodies headed off down the path towards the coast. The beach at Loe Bar was, as usual, hard and disruptive, especially against the wind. The course was fairly dry and the old slog up the coastal path had been replaced by a no less tough climb up a gravel track instead. 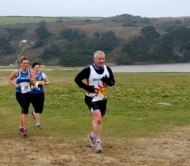 The wind hindered for most of the run but became more helpful for the sections round Culdrose and the final mad dash down the hill back to the finish was more about staying upright than smooth running. 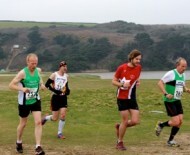 All in all a great race and well organised. 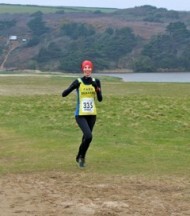 Thanks as usual to all the brave souls who marshalled in the cold so the rest of us could run. As many of you are all too aware, Tri Logic hold an annual Good Friday Swim. This is the first open water swim of the season and over the last few years has been at either Gylly beach in Falmouth or Carbis Bay. The swim is usually pretty short, for obvious reasons, and then we all retire to the nearest coffee shop to warm up. The swim is not a great distance so it's open to anybody daft enough to want to swim in the sea in late March. Lots of brave souls turned up today and dutifully went out for the pre-emptive run along the coastal path towards the Helford. 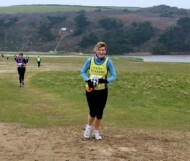 It was pretty gusty and the returning windswept runners looked like they'd certainly had an interesting experience. Everybody seemed to have enjoyed it despite the weather and the primarily offroad route was good. I'd decided against the run so spent the time watching the waves crash into Swanpool beach. Considering the run was only an hour after low tide there was a lot of water breaking on the beach due to a high storm surge. At times there was a four foot beach dump and the gravel was being sucked back into surf by each retreating wave. Everybody decided that the swim wasn't a safe option and discretion being the better part of valour we all retired to the sanctuary of Gylly cafe for coffee and cake. The swim will be re-scheduled for later in the year so watch this space if you fancy getting cold and wet for no good reason.